Played flute since grade 3, bassoon since grade 9. 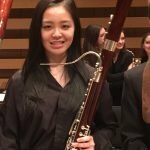 Currently studying at the University of Toronto Faculty of Music, Bassoon performance. Have joined in TSYO for two years.